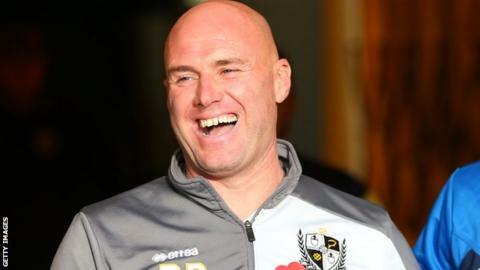 Northampton Town have appointed Port Vale manager Rob Page as their new boss on a three-year contract. The 41-year-old former Wales defender had been in charge of Vale since October 2014 and led them to a 12th-placed finish in League One this term. The Cobblers have agreed compensation with Page's former club and he replaces Chris Wilder, who left last week. "We are pleased to have recruited an outstanding young manager like Rob," said chairman Kelvin Thomas. "After an excellent playing career at all levels, Rob is an energetic, young and ambitious manager, but someone who has also managed nearly 100 games in League One. "He knows what the level is all about and that was important to us in our search." Page had a year left on his deal at Port Vale, where he had been youth team coach, assistant manager and caretaker manager following Micky Adams' resignation in September 2014. He had been linked with the Sheffield United job, which was taken by Wilder, but joins a club which won League Two by 13 points last season. The ex-Blades and Watford defender will be joined by performance coach John Harbin, with further backroom additions to be announced. Following Page's departure, midfielder Michael Brown has been added to the first-team coaching staff at Vale Park, and will "assist the chairman in the process of appointing a new manager and with player recruitment for the time being".